The nose is one of the primary sensory organs responsible for the sense of smell, while it also plays major roles in respiration and speech production . The nasal cavity lies just behind the two nostrils and forms the interiors of the nose. It makes up the upper respiratory system along with the paranasal sinuses, oral cavity, pharynx, and larynx , and is the first of the structures that form the respiratory tract . The nasal cavity begins from the base of the skull and is separated from the oral cavity below by the hard palate (roof of the mouth) . Vestibule: The area lying just posterior to the nostrils, this is the part of the nasal cavity most exposed to the threats of the environment. So, this part is lined with multiple layers of the same cells that make up our skin (stratified squamous epithelium), forming a protective barrier. This area also has stiff nose hairs (vibrissae) embedded in the cell lining and covered by thick mucus . 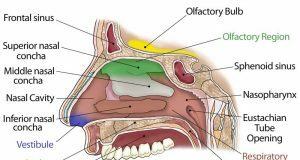 Respiratory region: It begins at the end of the vestibular area, and includes the entire nasal cavity, apart from the olfactory region . THis region has a ciliated pseudostratified epithelium lining (single cell layer) containing goblet cells  that secrete mucus that forms the mucus membrane. 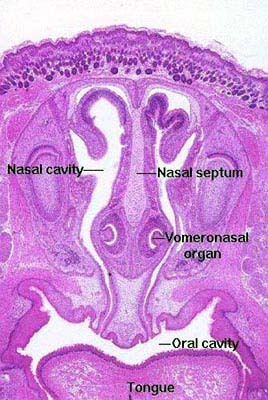 Olfactory Region: The top part of the nasal cavity, near the septum, is lined with olfactory cells and olfactory mucosa . The mucosa houses countless cilia, containing olfactory receptor proteins that are responsible for the sense of smell. 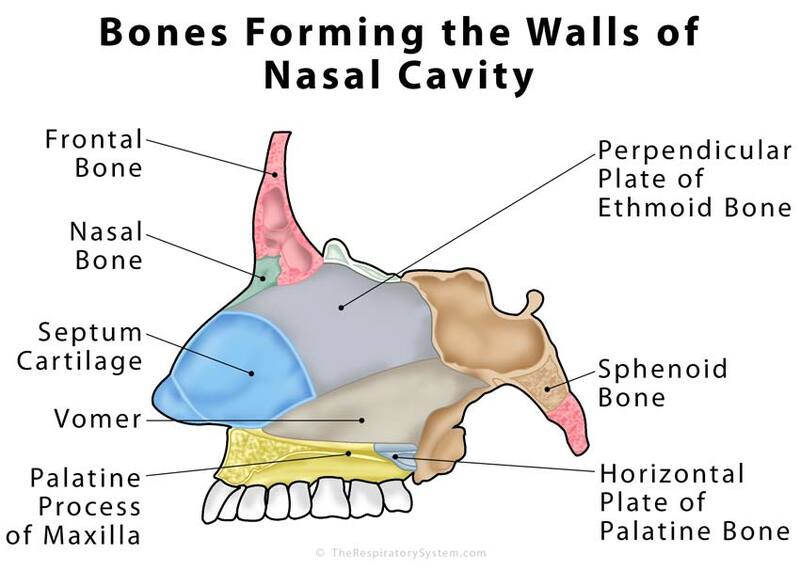 Medial Wall: This refers to the septum dividing the nasal cavity into two equal sections. The bony upper- and lower-back parts of the septum are formed by the perpendicular plate of the ethmoid bone , and the vomer . The lower front part is formed by a quadrangular hyaline cartilaginous structure, known as the septum cartilage . The lower part of the smooth medial wall can be seen from the outside, dividing the two nostrils. Superior Border (Roof): The two nasal bones, the lower part of the frontal bone, the cribriform plate (of ethmoid bone), and the sphenoid bone [1, 10] make up the roof. Anterior Border (Lateral Wall): The lower parts of the nasal bones, the cartilage attached to them, the outer nose, and the nostrils are there in the front part of the nasal cavity . Posterior Border (Back Wall): The upper-back and sides are bordered with a number of cranial bones including the maxilla, ethmoid bone, palatine bone, sphenoid bone, lacrimal bone, as well as the inferior concha . Floor: Apart from keeping the nasal cavity separated from the oral cavity, the hard palate, formed by the maxilla (palatine process) and the palatine bones (horizontal plates), also makes up its smooth floor . The nasal and oral cavities are connected with each other through the nasopharynx at the back of the throat. The soft palate and the uvula (a fleshy protrusion at the back of the throat) together move up to close off this connection during eating to prevent food from entering the nasal cavity . Unlike the medial wall and the nasal cavity floor, the lateral wall has a few small bony projections that give it an uneven surface. These projections are created by the three nasal conchae, also referred to as nasal turbinate bones [13, 14]. Both the superior and middle nasal conchae project from parts of the ethmoidal labyrinth (part of the ethmoid bone) , while the inferior nasal concha is an individual bony structure . They contribute to divide the breathing space within the cavity into the tree meatuses and allow the inhaled air to better interact with the different parts of the cavity . There are some mucus-lined air-filled spaces among the bones of the face and skull that help to keep the head lightweight and play vital roles in respiration as well as speech . Four sets of sinuses have been recognized; frontal, sphenoid, ethmoid, and maxillary, all having an opening into the nasal cavity . The anterior ethmoidal sinuses, as well as the frontal and maxillary sinuses, drain into the middle meatus, the opening marked with a crescent groove, called the semilunar hiatus, on the lateral wall of the cavity . The middle ethmoidal sinuses form a bump, the ethmoidal bulla, in the lateral walls and drain into it. The posterior ethmoidal sinuses drain out near the superior meatus. The only remaining one, the sphenoid sinus, empties into the posterior roof of the cavity . The tear duct (nasolacrimal duct) drains tears into the nasal cavity, leading from the eyes and opening into the inferior meatus . The auditory tube (Eustachian tube) also opens near the inferior meatus . The rich vasculature of the nasal cavity helps with the monitoring of temperature and humidity of the inhaled air. Branches of both the internal carotid artery and external carotid artery are responsible for the blood supply in this area . The three primary sources of the arterial supply are the ophthalmic, maxillary, and facial arteries. There are smaller branches, including the anterior and posterior ethmoid arteries, the sphenopalatine, greater palatine, and superior labial arteries that correspond with the above three branches . The facial and ophthalmic veins are responsible for the venous drainage of the external nose . The innervation in this region can be divided into two parts: special (olfactory) innervation and general innervation. The olfactory nerve, the first of the cranial nerves, is responsible for the sense of smell and branches from the brain’s olfactory bulb . The general innervation refers to the nerve connection to the nasal septum and the lateral walls, delivered by maxillary nerve branches (nasopalatine nerve) and ophthalmic nerve branches (nasociliary nerve) . The trigeminal nerve provides innervation to the external part of the nose . Role as a Passage for Inhaled Air : During inhalation, air enters through the nostrils and passes via the nasal cavity into the pharynx and larynx, the next sections in the respiratory tract, to eventually reach the lungs. The exhaled air travels in the reverse path and leaves the body through the nasal cavity. Role of Mucus Membrane in Purifying the Air: The thick mucus membrane, along with the vibrissae present in the inner walls of the nasal cavity, purifies the inhaled air by trapping any dust, bacteria, and foreign particles in it, allowing only clean air to enter the body. The small hair-like projections, or cilia, works to move the dust particles trapped by the mucus membrane to the back of the throat where they may be swallowed , or to the nose where can be eliminated through sneezing or blowing out . It also humidifies and warms up the inhaled air to monitor the nature and temperature of the air that enters the respiratory tract . During exhalation, it absorbs heat and moisture from the air on its way out from the body . A recent study states that a human nose is capable of recognizing about 1 trillion different smells . The olfactory mucosa contains around ten million olfactory cells, each having 350 types of smell receptors. These 350 receptors are each characteristic of a distinct type of odor. 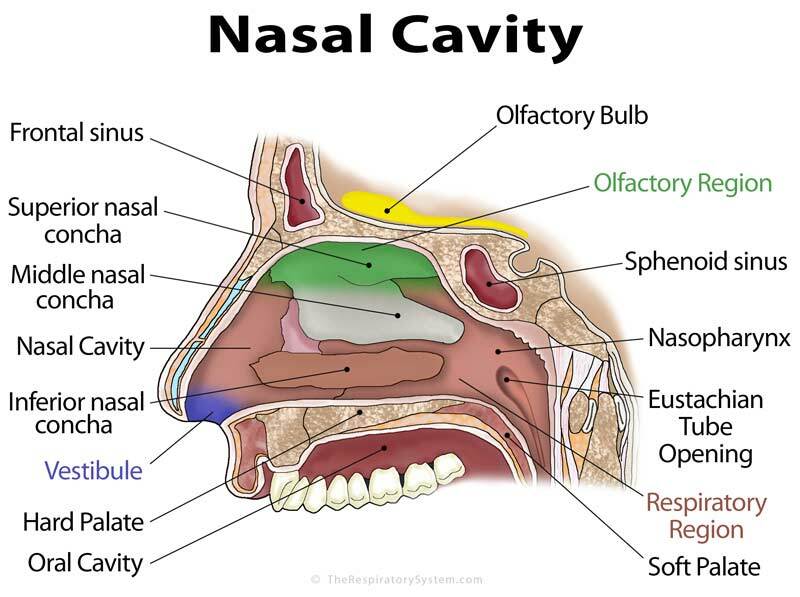 When air enters the nasal passage, a small part of it goes to the olfactory area . The receptors then carry odorants present in the air to specific neurons to be carried to the olfactory bulb in the forebrain , where they are identified as different smells . It is an important part of the vocal tract, with the oral cavity, pharynx, and larynx being the other organs involved in producing sound . For speech production, an air stream is modified by the larynx as well as nasal and oral cavities, depending on the type of sound to be produced. For a nasal consonant (nasal sound), the air is sent to pass through the nasal cavity, while for an oral consonant (oral sound), the air has to escape through the oral cavity . Cancer: A relatively rare form of cancer involving the nasal cavity and paranasal sinuses, it may occur due to a pronged exposure to toxic fumes, excessive smoking, or old age. Certain strains of human papilloma virus are also believed to be responsible in some cases . Symptoms include blocked nose, nosebleeds, pus discharge, reduced sensitivity to smell, formation of lumps or sores inside nose and pain around the eyes or upper teeth . Common treatment methods involve chemotherapy, radiation therapy, and surgery to remove the tumor . Nasal Polyps: Sometimes, there are small benign lumps growing from the nasal cavity or sinus linings, often due to chronic inflammation resulting from allergies, infections, chronic asthma, or immune disorders . They do not usually cause any problems, but if the polyps grow large, one may experience nasal congestion, runny nose, sneezing, trouble with taste and smell, frequent infections, as well as facial pain, and itching . Rhinitis: Swelling and inflammation of the mucus lining of the nasal cavity, rhinitis can be classified into allergic and non-allergic, depending on its causative factors . The former occurs due to exposure to allergens like pollen, dust, pets, etc. The non-allergic form may result from some viral infection, environmental changes or even hormone imbalances that cause mucus and fluid build-up in the nasal tissues and swelling of blood vessels . Symptoms include blocked nose, irritation, burning sensation, runny/dry nose, and sneezing that may go away on their own or may need medications and nasal sprays. Sinus Infection: A viral, bacterial, or fungal condition, it is characterized by a swollen and inflamed nasal cavity. Also known as a sinus headache or sinusitis, it causes pain and pressure in and around the sinuses, forehead, eyes, and teeth . Treatment depends on the cause of the infection .